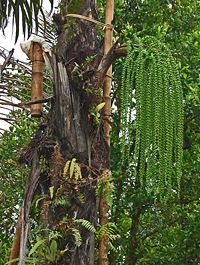 Medical plant(Arangapinnata) including species of palm, firmly rooted and spread everywhere. Palm has many benefits for humans, among others: petals of male flowers can produce latex as a material for palm sugar, fruit can be made kolang kaling(a kind of dessert in indonesia) and forth to mix the fiber food / beverage, for water catchment,doormat and broom. Aged 15-20 knew palm can produce as much as 8 liters of juice per day and when cooked can produce 25-35 kilograms and pacing. But in general do not like coconut tree farmers, because their roots spread everywhere and can damage plants in the vicinity. this medical plant usually grow and reproduce well in the jungle. 1. Fever Ingredients for: 1 cup warm water, a piece of palm sugar. Method: mix and stir until evenly distributed. How to use: drinked ordinary. 2. Stomach Pain Ingredients: 1 cup warm water, a piece of palm sugar, tamarind has been cooked sufficiently. How to make: all ingredients and stir until evenly mixed, then filtered to take water. How to use: drinked ordinary. 3. Difficult to dispose of water Ingredients: 1 cup warm water, a piece of palm sugar. Method: mix and stir until evenly distributed. How to use: drinked ordinary.